Oakland is the largest city and the county seat of Alameda County, California, United States. To see traveler tips and tourist information, read our Oakland day trip planning website . Budapest, Hungary to Oakland is an approximately 18-hour flight. Due to the time zone difference, you'll gain 9 hours traveling from Budapest to Oakland. Traveling from Budapest in June, you will find days in Oakland are slightly colder (26°C), and nights are about the same (15°C). On the 6th (Thu), you're off toSan Francisco. Do some cultural sightseeing at Alcatraz Island and SS Jeremiah O'Brien. Step out of the city life by going to Twin Peaks and Fishing Charters & Tours. And it doesn't end there: take in the waterfront at Fisherman's Wharf, engage your brain at Exploratorium, look for all kinds of wild species at Fort Funston National Park, and snap pictures at Golden Gate Bridge. For reviews, traveler tips, more things to do, and tourist information, go to the San Francisco trip maker website . San Francisco is just a stone's throw from Oakland. June in San Francisco sees daily highs of 25°C and lows of 15°C at night. Wrap up your sightseeing on the 9th (Sun) early enough to drive to Monterey. Monterey is a city in the U.S. Start off your visit on the 9th (Sun): appreciate the extensive heritage of Cannery Row, then contemplate the waterfront views at Monterey Bay, and then get to know the fascinating history of Pacific Grove Oceanview Boulevard. To see maps, other places to visit, reviews, and more tourist information, read Monterey trip itinerary builder app . You can drive from San Francisco to Monterey in 2.5 hours. Other options are to fly; or do a combination of train and bus. In June, daytime highs in Monterey are 23°C, while nighttime lows are 13°C. Wrap up your sightseeing by early afternoon on the 10th (Mon) to allow enough time to drive to San Luis Obispo. San Luis Obispo, or SLO for short, is a city in the U.S. Kick off your visit on the 10th (Mon): take in the history at Mission San Luis Obispo de Tolosa. To see traveler tips, where to stay, ratings, and other tourist information, read San Luis Obispo trip itinerary planning site . Traveling by car from Monterey to San Luis Obispo takes 2.5 hours. Alternatively, you can take a bus; or take a train. When traveling from Monterey in June, plan for a bit warmer days and about the same nights in San Luis Obispo: temperatures range from 30°C by day to 13°C at night. Cap off your sightseeing on the 11th (Tue) early enough to travel to Norwalk. Norwalk is a suburban city in Los Angeles County, California, United States. Plan a trip to Norwalk easily and quickly by telling Inspirock to suggest an itinerary. Drive from San Luis Obispo to Norwalk in 3.5 hours. Traveling from San Luis Obispo in June, you can expect nighttime temperatures to be somewhat warmer in Norwalk, with lows of 20°C. On the 12th (Wed), you're off toLos Angeles. 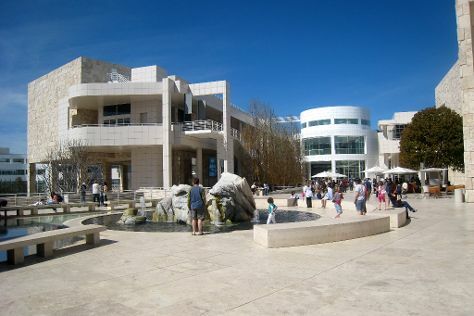 Get a sense of the local culture at The Getty Center and Griffith Observatory. Relax by the water at Venice Beach and Boardwalk and Santa Monica State Beach. Take a break from Los Angeles with a short trip to Santa Monica Mountains in Santa Monica, about 1h 10 min away. Pack the 15th (Sat) with family-friendly diversions at Universal Studios Hollywood. And it doesn't end there: learn more about the world around you at La Brea Tar Pits and Museum, stroll the grounds of Hollywood Forever Cemetery, explore the world behind art at Diorama-museum of Bhagavad-gita, and see the interesting displays at The Grammy Museum. To see other places to visit, where to stay, reviews, and tourist information, read our Los Angeles travel planner . Los Angeles is just a short distance from Norwalk. In June, daily temperatures in Los Angeles can reach 30°C, while at night they dip to 19°C. Cap off your sightseeing on the 16th (Sun) early enough to go by car to San Diego. To find reviews, traveler tips, ratings, and tourist information, you can read our San Diego trip itinerary planner. Traveling by car from Los Angeles to San Diego takes 2.5 hours. Alternatively, you can take a bus; or fly. Traveling from Los Angeles in June, expect nights in San Diego to be about the same, around 20°C, while days are slightly colder, around 26°C. On the 17th (Mon), you'll have the morning to explore before heading off to Las Vegas. Satisfy your inner culture vulture at The Strip and The Neon Museum. The Mob Museum and Madame Tussauds - Las Vegas will appeal to museum buffs. Step out of Las Vegas to go to Fort Mohave and see Willow Beach, which is approximately 1h 10 min away. And it doesn't end there: immerse yourself in nature at Red Rock Canyon National Conservation Area, identify plant and animal life at Lake Mead National Recreation Area, examine the collection at Pinball Hall of Fame, and admire the local landmark of Bellagio Fountains. Getting from San Diego to Las Vegas by flight takes about 3.5 hours. Other options: drive; or take a bus. Traveling from San Diego in June, you will find days in Las Vegas are much hotter (46°C), and nights are somewhat warmer (29°C). Finish your sightseeing early on the 21st (Fri) so you can drive to Flagstaff. Do some cultural sightseeing at Meteor Crater and Honshin Fine Art. 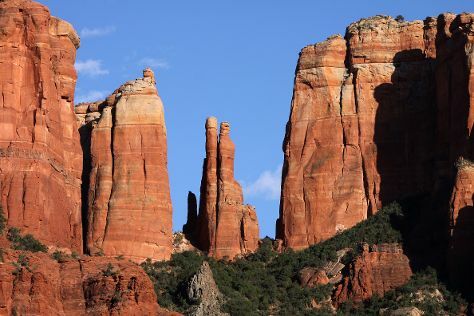 Take a break from the city and head to Cathedral Rock and Bearizona Wildlife Park. Get out of town with these interesting Flagstaff side-trips: Sedona (Oak Creek Canyon, Spas & Wellness, & more). To find traveler tips, other places to visit, reviews, and more tourist information, read our Flagstaff travel planner. You can drive from Las Vegas to Flagstaff in 4.5 hours. Alternatively, you can fly; or do a combination of flight and bus. The time zone difference when traveling from Las Vegas to Flagstaff is 1 hour. Traveling from Las Vegas in June, things will get much colder in Flagstaff: highs are around 32°C and lows about 8°C. Finish your sightseeing early on the 24th (Mon) so you can travel to Barstow. Barstow is a city in San Bernardino County, California, United States. Start off your visit on the 24th (Mon): take an in-depth tour of The California Route 66 Museum, revel in the low prices at Outlets at Barstow, and then see a world frozen in time at Calico Ghost Town. On the 25th (Tue), you'll have a packed day of sightseeing: look for all kinds of wild species at Rainbow Basin Natural Area, get a sense of history and politics at Barstow Harvey House, then make a trip to Elmer's Bottle Tree Ranch, and finally don't miss a visit to Barstow Station. For photos, more things to do, other places to visit, and more tourist information, you can read our Barstow driving holiday planning tool . Getting from Flagstaff to Barstow by car takes about 5.5 hours. Traveling from Flagstaff to Barstow, you'll gain 1 hour due to the time zone difference. In June, Barstow is much warmer than Flagstaff - with highs of 46°C and lows of 26°C. Finish up your sightseeing early on the 25th (Tue) so you can travel to Mammoth Lakes. Mammoth Lakes is a town in Mono County, California, the county's only incorporated community. 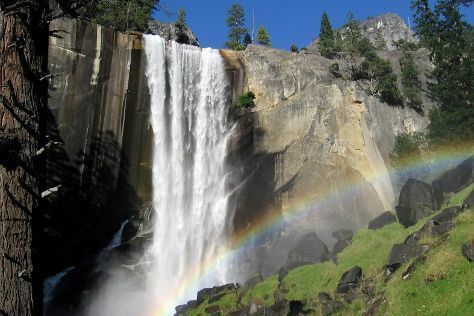 On the 26th (Wed), admire the sheer force of Vernal Fall, take some stellar pictures from Half Dome, and then take an in-depth tour of Mammoth Museum at the Hayden Cabin. Get ready for a full day of sightseeing on the next day: tour the pleasant surroundings at Tuolumne Meadows and then cruise along Tioga Pass. For ratings, where to stay, and more tourist information, you can read our Mammoth Lakes road trip planning site . Traveling by car from Barstow to Mammoth Lakes takes 4.5 hours. Traveling from Barstow in June, things will get colder in Mammoth Lakes: highs are around 30°C and lows about 7°C. Finish your sightseeing early on the 27th (Thu) so you can travel to Three Rivers. Three Rivers is an unincorporated community in Tulare County, California, United States. Start off your visit on the 28th (Fri): explore the wealth of natural beauty at Sequoia and Kings Canyon National Parks. Get ready for a full day of sightseeing on the next day: don't miss a visit to Tunnel Rock, then hike along Crescent Meadow Rd, and then trek along Lakes Trail in Sequoia National Park. For traveler tips, where to stay, more things to do, and tourist information, you can read our Three Rivers visit planner. Traveling by car from Mammoth Lakes to Three Rivers takes 6 hours. Expect somewhat warmer temperatures when traveling from Mammoth Lakes in June; daily highs in Three Rivers reach 40°C and lows reach 19°C. Wrap up your sightseeing on the 29th (Sat) to allow time to travel to Sacramento. Kick off your visit on the 30th (Sun): have some family-friendly fun at Fairytale Town, then tour the pleasant surroundings at American River Bicycle Trail, then see the interesting displays at California State Railroad Museum, and finally contemplate in the serene atmosphere at Cathedral of the Blessed Sacrament. For where to stay, more things to do, photos, and other tourist information, read our Sacramento trip planner. You can drive from Three Rivers to Sacramento in 4 hours. Another option is to fly. Expect a daytime high around 38°C in June, and nighttime lows around 17°C. Cap off your sightseeing on the 30th (Sun) early enough to go by car to Napa. Kick off your visit on the 1st (Mon): explore the world behind art at The Hess Collection Winery & Art Museum, learn about winemaking at Robert Mondavi Winery, then do a tasting at V. Sattui Winery, then take in the exciting artwork at Mumm Napa, and finally look for gifts at Oxbow Public Market. To see reviews, more things to do, traveler tips, and tourist information, read our Napa road trip website . You can drive from Sacramento to Napa in 1.5 hours. Alternatively, you can take a bus; or do a combination of train and bus. Prepare for little chillier weather when traveling from Sacramento in June: high temperatures in Napa hover around 31°C and lows are around 13°C. Finish your sightseeing early on the 2nd (Tue) so you can travel to Pacifica. Pacifica is a city in San Mateo County, California, on the coast of the Pacific Ocean between San Francisco and Half Moon Bay. Get some historical perspective at Filoli and Pigeon Point Light Station. 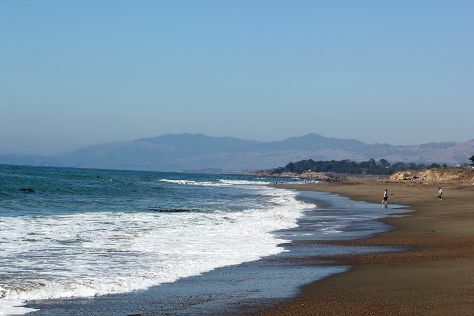 Visit Fitzgerald J V Marine Reserve and San Gregorio State Beach for some beach relaxation. 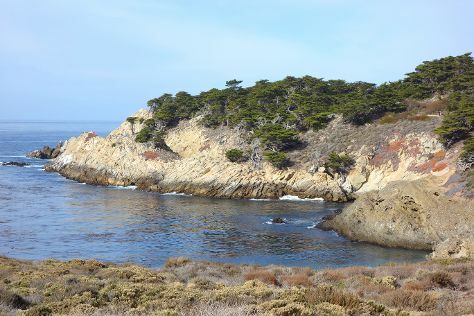 Get out of town with these interesting Pacifica side-trips: Ano Nuevo State Reserve (in Pescadero), Tall Trees Grove (in Redwood National Park) and Hiller Aviation Museum (in San Carlos). Next up on the itinerary: enjoy the sand and surf at Half Moon Bay State Beach, immerse yourself in nature at Gray Whale Cove State Beach, trek along Devil's Slide Trail, and stroll through Mori Point. For maps, other places to visit, reviews, and other tourist information, use the Pacifica vacation planning tool . Getting from Napa to Pacifica by car takes about 1.5 hours. Traveling from Napa in July, expect nights in Pacifica to be about the same, around 16°C, while days are a bit cooler, around 26°C. You'll have a few hours on the 7th (Sun) to wrap things up before traveling home.